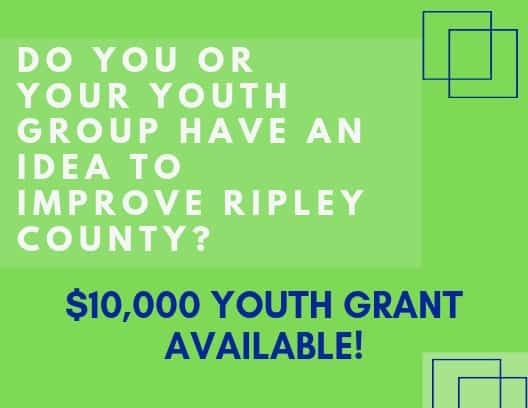 Ripley Youth Outreach members developed the Change Ripley County Grant to provide local youth, ages 14-23, with the resources needed to bring their ideas for enhancing the quality of life in their communities to reality. “Over the past three years, local youth and youth organizations have consistently identified a “lack of funding” as a major hurdle in their ability to address the needs important to them, and their peers,” stated Amy Streator, RCCF Executive Director. “This grant opportunity was designed to fill the funding gap which is stymieing young people’s community development efforts,” stated Streator. This is a competitive grant process designed to support youth led projects and programs within Ripley County. One grant in the sum of $10,000 shall be awarded to a local non-profit organization which is guiding the youth through the project development process. Grant applications are due May 3, 2019 at 4:00 pm. Information about this grant and the grant applications are available at https://rccfonline.org/youth-outreach/. The Ripley County Community Foundation is located at 13 E. George St, Suite B, Batesville, IN and can be reached via telephone (812) 933-1098 or via email office@rccfonline.org.